Tour the beautiful shoreline of the Florida Keys in the World's first Cadillac style Nautical Stretch-Limousine on the water! Make your very special day into an unforgettable experience - Birthday, Anniversary, Wedding. Board the NautiLimo and tour the islands in real "Limo" style. Watch heads turn as you and your friends ride to your favorite waterside restaurant and "watering holes". 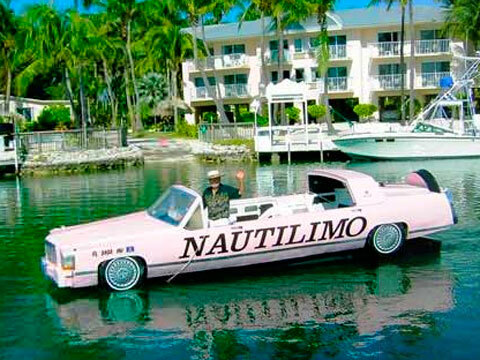 The NautiLimo is a car that thinks it's a boat or is it a boat that thinks it's a car?? You be the judge! NautiLimo is designed to carry 1-6 passengers on the sheltered waters of Florida Bay. Your limo is powered by a 100 hp Yamaha engine and has all required safety equipment on board. Florida Keys vacation travel is not complete without a Cruise on Florida Bay aboard the NautiLimo. Featured on ABC television network, Fox channel, CBS network ("The Early Show").